Microsoft has one, Intel has one, and now Samsung has built theirs. These companies are all building their own show home demonstrating the possibilities of IoT within the connected home. However, Samsung is going a bit further. Through its construction division Samsung C&T, they want to start building these connected homes for customers. 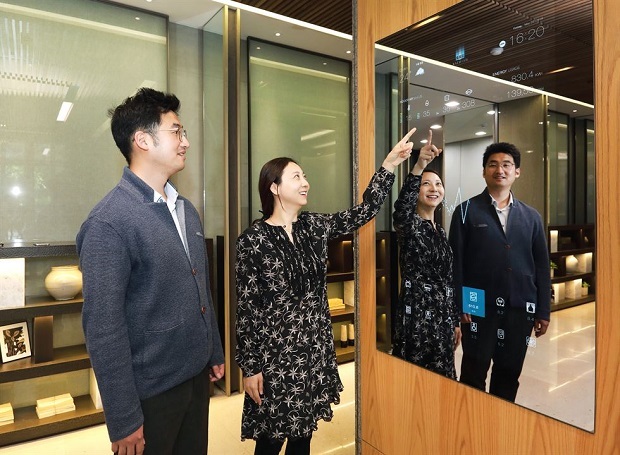 In its home country of South Korea, Munjeong-dong, Songpa-gu, Seoul; Samsung C&T has set up the “Raemian IoT HomeLab” to demonstrate the latest in IoT solution within the home. Do you have a Garmin vivosmart3, Samsung Gear Fit2 Pro or a Samsung Gear Sport? UnitedHealthCare is allowing some of its customers to save on health insurance, as part of its UnitedHealthcare Motion wellness program. According to UnitedHealthCare, participants have collectively tracked themselves making 130 billion steps, and earning more than $19 million in incentives since the program launched in 2016. Technavio released their latest market study of the global smart connected cooking appliances market, according to the report titled ‘Global Smart Connected Cooking Appliances Market 2017-2021’, we can expect to see a CAGR of close to 20% between 2017 and 2021. The study looked at Ranges, Ovens and others from manufacturers such as Robert Bosch, LG Electronics, Samsung, Behmor, Koninklijke Philips, Haier (GE Appliances), Breville, and Whirlpool. It’s just over a year now that Samsung acquired SmartThings, and to show us what they have been doing with SmartThings since the acquisition, they were at IFA in Berlin. At the show, they launched an upgraded version of the SmartThings Hub with a new design and a more powerful processor to support video monitoring; now called the “Smarthub” and a range of sensors. They have also used the opportunity to announce products for the UK connected homes. Since Samsung acquired Smartthings the company has make qualms about its intension the dominate the connected space. Today at its developers conference the company announced new software release the will help developers create solutions for the connected health, smart wearable and connected home market. The company said it is expanding its domain from personal wellness to preventive healthcare service. Samsung has connected all the dots and has laid a foundation for a future in the connected home. Through its recent acquisition of SmartThings, they now have a platform to connect all their smart devices. They now have a connected home portfolio with touches every aspect of our daily lives. On the run up to IFA 2014 Samsung shared with us their plans for the future connected home and the Internet of Things (IoT). After coming to an agreement with Apple on their ongoing patent battle, Samsung is keen to play a bigger role in the growing connected home market. The company has been offering some form of connected solution for sometime but has never showed a real interest, until now. They have announced the acquisition of home automation startup SmartThings. They now join Microsoft, Google, Cisco, Apple and many more in showing a bigger interest in the connected home market. Rather than using an Omega Seamaster James Bond (007) will soon be using a smart watch maybe one like the new Samsung Gear 2 Smartwatch. In addition to lunching rockets and helping to get him out of tight situations it could enhance his bachelor pad. iControl in partnership Samsung has become the first smart home solutions provider to allow access to connected home devices via the New Samsung Gear 2.